This is the bible on recovering from RSI. Recognizing the early signs and risk factors, Finding a doctor, Preventing RSI, recovering. This book contains stretching exercises to gently relieve the tension in your body and to strengthen weak muscles. The exercises I employed are on page: 106, 110, 112, 116, 128, 130, 134. I perform them religiously every morning. Alternatively, you can try signing up for Pilates or gentle yoga classes, preferably with an instructor that understands your special needs. We need to mobilize our muscles and bodies. Sitting in 1 static position needs to be countered. I found that one on one instruction was essential. Finding a good yoga teacher is especially difficult. Many poses cause problems for RSI sufferers. I learned Trigger points are where muscle problems are located. They can cause pain often far down the line. My shoulder caused my fingers to ache! Once we figured it out, we could address the real problem. Using this book I learned techniques to minimize these trigger points by self-massage. I also utilized a Massage Therapist to help me find trigger points. My condition was covered in pages 88, 90, 98, 139, along with solutions. 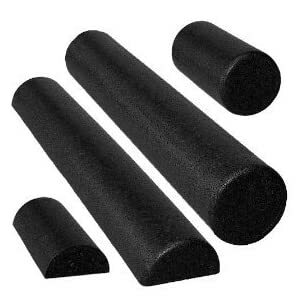 Also consider buying a foam roller to perform some of the stretches on. I find it essential to stretch my back on top of the roller. Just laying on it helps counter the forward slump most computer users have. 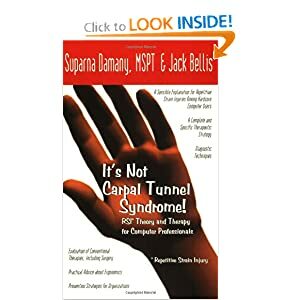 It’s Not Carpal Tunnel Syndrome! RSI Theory & Therapy for Computer Professionals by Jack Bellis and Suparna Damany. I was looking through a book store and came upon this book. The title says it all. Very small percentage of people actually have Carpal Tunnel Syndrome, far more have Tendinitis or some other condition. The book is worth buying as it draws upon many user experiences. It clearly goes over human anatomy, injury, diagnosis, various therapies, prevention, ergonomics, stretches, and lifestyle issues. When you are dealing with such a debilitating condition, you should arm yourself with as much information as possible for Carpal Tunnel Treatment. I have been keeping a log book listing my pain level with notes on what I did that day for a while. I find it helpful to understand what aggravates my condition and what therapies really helped. I have an entry for when I wake, noon time, and evening time. I use the 1-10 pain severity scale. Because healing happens slowly, you can really see progress when comparing current results to logs months ago. (C) 2010-2016 NF8LF, LLC - All Rights Reserved. Always consult with a doctor before using any program to help RSI or Carpal Tunnel Syndrome. We are not doctors.